Front Street Cafe is proud to be hosting an art installation in conjunction with Tongue & Groove Spontaneous Theater, Adrienne Theater & Philadelphia Fringe Arts Festival. As many of you know FringeArts is Philadelphia’s home for contemporary performance, presenting progressive, world-class art that stretches the imagination and boldly defies expectation. As the city’s lead experimenter in the arts, FringeArts exposes audiences to unpredictable dance, theater and music performances by accomplished and emerging innovators who are pushing the boundaries of art-making and redefining the artistic landscape worldwide. The Fringe Festival, presented by FringeArts, is a 17-day, city-wide celebration of innovation and creativity in contemporary performance. Each September, the Festival explodes into every nook and cranny in neighborhoods across Philadelphia with more than 1,000 artistically daring performances, including national and international performances curated by FringeArts, and works that are produced by independent artists and promoted by FringeArts. The party continues late night, every night, with music, food and drink at FringeArts’ center on the Delaware River waterfront. This vast assemblage of curated and self-produced innovators offers an unparalleled opportunity to see a cross section of the world’s greatest experimenters at one time, in one city. Year-round programming is presented at FringeArts’ state-of-the-art center on the Delaware River Waterfront—a renovated historic building that also houses a restaurant and beer garden. Each September, the organization presents the annual Fringe Festival, a 17-day celebration that fills the city’s neighborhoods with more than 1,000 curated and independently produced contemporary performances. For Fringe 2016 Front Street Cafe is the proud host of an interactive art installation. Tongue & Groove is installing a Before I Die interactive chalkboard mural, to be unveiled on Sept 8 at 6:30pm at its groovy location at the Front Street Cafe in Fishtown. For the installation party they will have music from the booty-shaking Brazilian Samba band, Unidos da Filadelfia! And you can enjoy delicious food, beer and fresh juices from the Cafe. Anyone can add their hopes and dreams to it; responses from the mural will be added to audience responses to inspire each T&G Fringe performance. Responses off the wall will be mixed with audience responses submitted at the theater. The actors will use these anonymously-submitted bucket-list dreams to inspire a montage of hilarious and heartbreaking scenes and monologues. 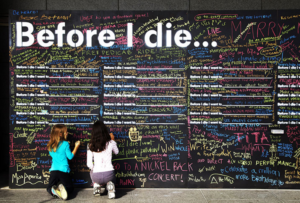 TICKETS for BEFORE I DIE are AVAILABLE THROUGH FRINGEARTS. SCROLL DOWN TO PURCHASE.